Ice Fishing Report November 30, 2013 Jeff Sundin - Hoofin' It To The Walleye Hole - Already made it to the top of the list for MORE THAN A FEW Grand Rapids area anglers on Friday. Ice now covers 90% or more Northern minnesota area lakes and now ranges in thickness from 2 to 8 inches depending on when the lakes first froze up. On Friday, Deer Lake's main basin was ice covered for the first time. The thin sheet of clear, shiny ice was free of snow cover, telling me that the Blue water lake had succumb to winter temperatures during the wee hours of Friday morning. Every other lake, including most of the visible areas of the Mississippi River were snow covered, indicating that they'd been ice covered for several days. I had had hoped that somewhere along my tour of area lakes, I'd find an ice fishermen or two so that I could snap a couple of photos. You Know, get the winter theme set before December rolls in. That turned out to be easier than I thought. There are anglers covering lots of ground already and spotting portable ice shelters was as easy as finding a lake. In fact, on one lake alone, I counted 13 fish shelters. Northern Pike, as always are getting the lion's share of the attention. Dark house fishermen are always in a hurry to be the first one to stick a Pike. This year is no different, the spear houses are showing up on the shallow weedlines all over the Itasca area. Crappies, on smaller Grand Rapids area lakes are getting some attention already and so are Walleyes. 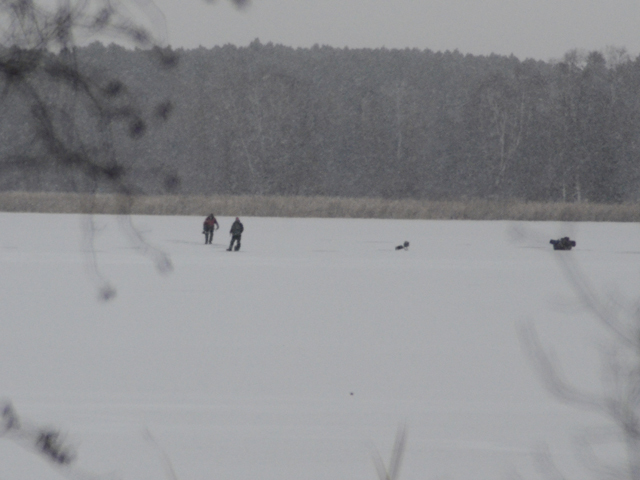 During the late afternoon, I happened to spot a group of anglers on the ice and walked out to pay them a visit. Jesse Aultman and his crew reported 5 inches, maybe more of clear, solid ice. Even better, Jesse already had a couple of Walleyes flopping on the ice. That makes him and his catch, the first sighting for me during this ice fishing season. If you're thinking about wetting a line this weekend, Grand Rapids and Deer River area bait shops are open, stocked up and ready for the traffic. In fact, I already had an early report this morning from Bill Powell who opened the doors at Fred's Bait, Deer River at 6:00 AM for his first "O-Fish-Al" day of the ice season. A man of few words, Bill said simply; "It was kinda busy". I think that it must have been, because it took about two hours to get an answer to my early morning text. Fishing Report November 29, 2013 Jeff Sundin - Happy "BLACK ICE" Friday! 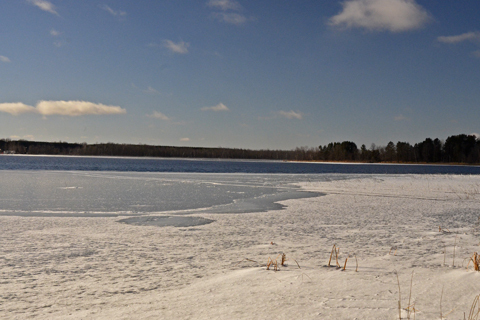 Here we go with Northern Minnesota's, Itasca area ice report. All week long, daytime high temperatures have rarely reached above the mid-teens. 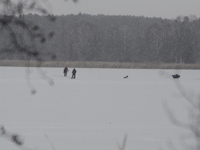 Ice conditions in are improving by the minute and on some lakes, ice fishermen have already punched their first holes. Snowfall on Wednesday was begining to concern area rental operators and bait dealers. But the fluffy, light snow didn't pile up too much and it's effect on the new ice should be minimal. In fact, one day of strong wind will probably push most of it off the ice. Total accumulation varried, but it was less than 3 inches most everywhere and less than an inch in many areas. On Thanksgiving, a quick trip to Crookston, Minnesota to see my daughter provided just enough time for lunch, (a big one), a chat, (a big one) and a hug (a big one). But the trip accross Highway 2 also gave me a chance to take a look at lots of lakes along the route. 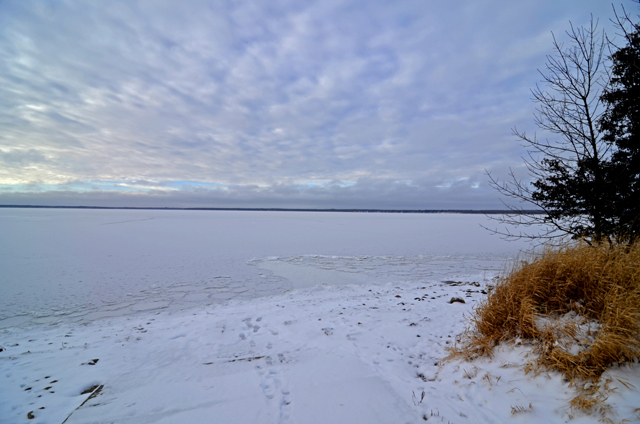 I already knew that all of the small waters would be frozen, so I was most interested is seeing Cass Lake and Pike Bay. These deep waters typically freeze later than most other waters and on Thanksgiving Day, they were apparently iced over completely. On this particular trip, there wasn't any sign of ice fishermen out on the lakes. But, no one would expect that on Thanksgiving Day. Today, Black Ice Friday, the scene is going to change. There are already reports of anglers making ready to head North this weekend for Red Lake Walleye fishing. Before I can take my first walk on the ice, I'll have a few chores to do. It's time to load up my snowmobile and trailer, get them prepped and road-worthy so I'll be on track for my first trip to Lake of the Woods in just two weeks. Once I have that in process, I will be on the ice myself early this up-coming week. (11/29) From Wired2Fish - Fenwick Selects College Pro Fishing Team; "After a national search and review of over 120 college applicants, Fenwick has selected the 2014 Fenwick Collegiate Pro Team. The 21 accomplished collegiate anglers were chosen based on academic performance, community outreach, tournament participation, as well as other criteria. “After careful consideration, we are extremely excited to welcome these anglers to Team Fenwick,” said Casey Davidson of Fenwick. “We had well over 100 applicants and were able to handpick ... Rewad Full Story, click >> Fenwick Selects College Pro Fishing Team . (11/29) Free Shipping On Lindy Orders This Weekend - As long as you're getting stocked up for the ice season anyway, you might as well take advantage of this offer. Lindy is giving away the shipping on all orders placed from now until December 2, 2013. Just click here to head for >> Lindy's Ice Fishing Section . (11/29) Paul DeWolfe passed along a note, courtesy of JR's Corners about ice conditions on Upper Red Lake; "Fishing has started! We have a few going straight out in front and some have taken ATVS on the shoreline, toward the Rockpile. There appears to be 3 to 5 inches of ice in most areas with more along the shore. We also, are seeing Some fish in 5 to 8 feet ofwater. Our plans are to have a few houses on the lake by the weekend. Foot traffic and portables are welcome as of right now. Hopefully some ATV traffic by the weekend. " JR's Corner Access, Upper Red Lake, MN (320) 290-3838 . Fishing Report November 28, 2013 Jeff Sundin - Ice Watch 2013 - Happy Thanksgiving! After a few days spent chasing Pheasants in the cattails of North Dakota and a short day to celebrate Thanksgiving, I'll be playing catch up in a big way. That's right; Ready or not, here we go. Winter is in a hurry to get here this season and it's jumped up and grabbed us. The ice is getting thicker by the minute and anglers are already beginning to find their way out onto frozen lakes. Yes, There are people ice fishing already; Mainly darkhouse anglers, who are always in a rush to be the first ones on the ice. But panfish anglers are snooping around and Walleye fishermen aren't far behind. On my way home from North Dakota on Wednesday, virtually every lake along the road was ice covered. There were ice fishermen on a couple of them and once the post Thanksgiving case of "nervous leg syndrome" sets in, there's gonna be a lot more. I'll be hurrying to catch my breath as the ice fishing season kicks in and the ice reports ramp up! Fishing Report November 24, 2013 Jeff Sundin - Ice Watch 2013 - They say that all good things come to those who wait. Well, I AM definitely an expert on waiting and definitely counting on good things! On Saturday, I almost tempted myself into the first walk of this season onto frozen water. In fact, I had one foot on the ice, ready to go, when I remembered my little escapade from last year. You may recall, an early walk that turned into a waste deep visit with the bottom of Moose lake. Not that getting wet is all that bad; But this time, I was at the beginning of my trip and if I'd busted a hole in the ice, I'd have to scrap the rest of my tour. Days that end at 5:00 PM don't allow a guy much time to squeeze everything in, so I played it safe, got back in the truck and kept on moving. Heading East along US Hwy 2 toward Grand Rapids, the Mississippi River downstream from the Pokegama Recreation Area was about 85% ice covered. All of the smaller, Grand Rapids area lakes are ice covered too. In fact, Forest Lake, McKinney Lake and others have been frozen for some time now. Heading North on Co. Rd 62 out of Cohasset, Bass Lake's South end is completely ice covered from South Bay all of the way up to the Wild Rice at the channel. By the time I got to the North end, things were different. 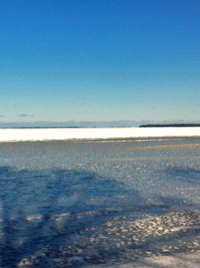 There is ice along the shoreline there, but 2/3 of the center of the North Bay is still open water. Deer Lake, as expected, was still mostly open water except for the back bays and protected shallow shoreline. Looking at photos from last year, Deer was just beginning to lock up on the 26th of November. By then there was more ice than water and it seems to be moving along that same path this year. 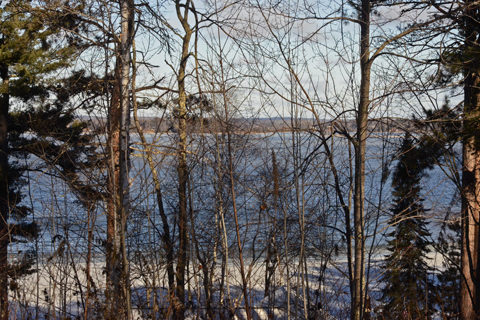 Almost all of the smaller, shallower lakes to the North of Deer River are either ice covered, or mostly ice covered and I see no reason not to expect reasonable "foot travel, access" to some fishing spots before the end of this week. In fact, I spied the location for my first walk already. Yup, it's all planned out. Now I just have figure out how to schedule it in between Muzzle Loader hunting and the Pheasant Hunting. (11/24) Just A Reminder, only a few days days left; The Canisteo Mine Pit remains open to liberalized fishing regulations. According to the Minnesota Department of Natural Resources (DNR). The regulations are already in effect and will end at sunset on Dec. 1. The Lake; "Canisteo Mine Pit (CMP) located north of Coleraine, Bovey and Taconite, in Itasca County, is a complex of mine pits abandoned in 1985. The complex has as area of 1,425 acres, a maximum depth over 300 feet, a mean depth near 100 feet, and limited littoral area as of 2010. 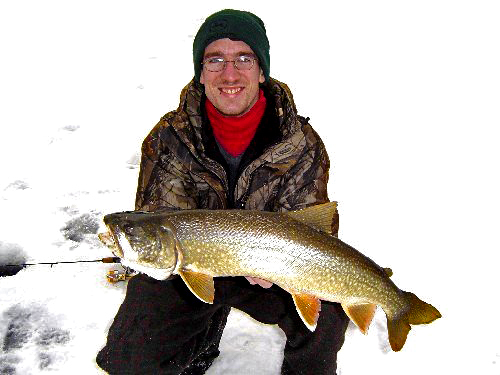 CMP has been managed for lake trout since the initial survey in 1995. Annual stocking of yearling, and occasionally adult, Isle Royale strain lake trout occurred from 1996 to 2005. Biennial stocking of Isle Royale strain yearling lake trout has occurred since 2007. All trout had a distinguishing fin clip to identify stocked fish, except some adults from 1997 to 1999 and 2002. Adult tullibee were introduced twice (2006 and 2008) in an attempt to provide a second, naturally sustaining prey species. Mining activity is resuming in this area and Magnetation, LLC. 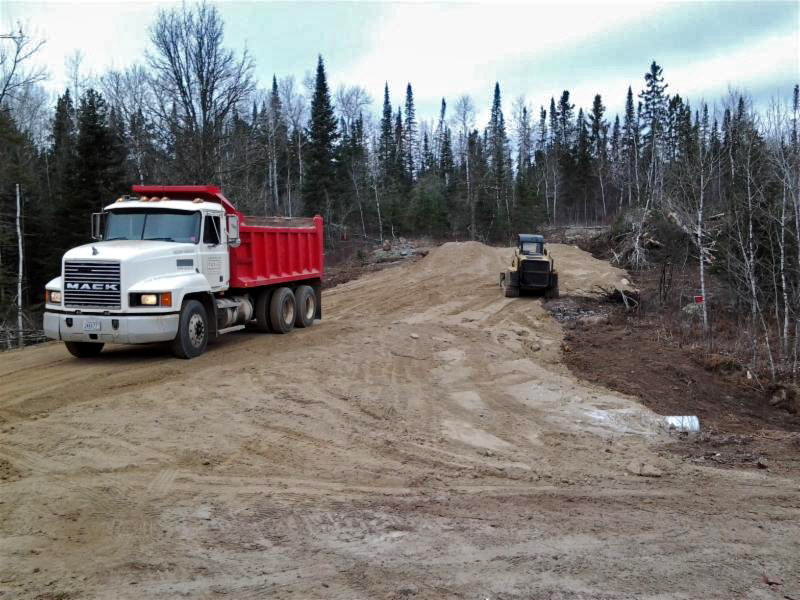 will be constructing a processing plant near the water access site currently operated by Itasca County. The water access will close on Dec. 1, 2013. The pit has been managed by the DNR for lake trout through stocking and natural reproduction. Largemouth bass, smallmouth bass, northern pike, bluegill and cisco are also present in the pit. Liberalized fishing regulations will allow the public to harvest and use these fish before access to the pit is no longer available. (11/24) 10 ESSENTIAL ICE FISHING LURES FOR WALLEYE - "What if you could only take 10 lures to the ice to catch walleyes? What would they be? With so many variables in water color, depth, fish mood, light penetration and more, plus so many styles, colors and sizes of ice baits to select from, it seems like you could carry a bucketful of baits onto the ice and still end up needing something you don’t have. We asked ice fishing expert Jon Thelen what he would have in his box if he could only pick 10 lures for catching walleyes through the ice, even having him narrow each pick to a single color and size. As importantly, we asked why each item made the list and how it would fit in his ice strategies. Foo Flyer, 3/16-ounce, Rainbow - Like a Slick Jig, a Foo Flyer darts sideways when it’s worked and covers a broader area than the diameter of the hole. It’s much more subtle than a Slick Jig, though, and glides to the side when it falls back through the water column. Thelen likes the generally natural look and the hints of pink and blue in the Rainbow color pattern. He normally works a Foo Flyer so that it" ... Read Full Story >> 10 ESSENTIAL ICE FISHING LURES FOR WALLEYE . Fishing Report November 23, 2013 Jeff Sundin - Ice Watch 2013, OH OH Guess What? - Remember the only saying about "watching grass grow"? Well, maybe you could do that if you have a ton of patience, but watching the ice form, that doesn't take much patience, that's going a lot faster! It's gonna speed up even more too because even though lakes in the Deer River area are already glassing over, take a look at that forecast? A week without any high temperature reaching above freezing, ever. That means that the ice fishing season is bearing down on Northern Minnesota a lot faster than we think. Just outside of my own back door, I noticed yesterday that the water dishes in the dog kennel and chicken coop only last a couple of hours before freezing. The venison that I had planned to ground into burger, has frozen solid, it's hard as a rock. Virtually all of the small ponds and shallow lakes have ice cover on them right now. The deeper waters of larger lakes are still holding out, but I'll bet that if I go take a look right now, I'll find more ice on these deeper lakes than I did yesterday. Even lakes that are notorious for being late freezers, turned up with ice cover along their shorelines on Friday. As always, I have to throw out a word of caution: Be careful about going for that first walk on the ice. Right now, you can be your own expert, there's just enough snow cover to give you an indication of when the lakes froze over. If there's an inch of snow, then there's liable to be good ice under it. If there's just a dusting, 1/4 inch or so, then it's only been iced over for a day, two at the most. If the ice is like glass, smooth and shiny, then it just froze last night. More photos today and soon, I'll start naming the lakes too. Fishing Report November 22, 2013 Jeff Sundin - Ice Watch 2013, Going Down? - Single digit temperatures and calm winds are just what the doctor ordered for Ice fishermen and I will guarantee that the lakes made some ice last night. Today, I'll take a tour of the area and snap some new photos to help get you up to speed. Before I do that though, there are a few bits of paperwork that I've been putting off and I just have to take a couple of hours to get caught up. Unless, there's some earth shattering news, it will likely be Saturday morning before I post the pics. But if I see some compelling reason to get them up sooner, I will post them this afternoon. Fishing Report November 21, 2013 Jeff Sundin - Ice Watch 2013, Going Down? - The weather on Wednesday was anything but a day for making ice. Still, even with warm temperatures and sunny skies, the ice cover that we already have refuses to disappear. The scene in my back yard is a little different this morning though. There's already a dusting of snow on the ground and the Southeast wind gave way to a Norwester over night. The current temperature, 25 degrees is predicted to be as high as it will get for the day, maybe even for the rest of the weekend. In the story below, Brian Castellano mentions breaking 1/2 inch of ice to find open water for his closing day duck hunt on Cutfoot Sioux. Yesterday, I mentioned that several of Deer River's smaller, shallow water lakes have and inch or two of ice cover that's been hanging on for over a week. Be ready, because as the temperatures fall, you'll be hearing the lakes singing the songs of first ice. It's my favorite part of the ice fishing season, I love being out there to hear the ice creeking and groaning as it finds it's place in the winter landscape. (11/21) From the Deer River Area - Brian Castellano checked in with "I closed out the northern MN duck season yesterday morning on Big Cutfoot. I didn't get set up till 8'ish, but had a flock of a dozen or so goldeneyes go whistling bye while I was putting the finishing touches on my decoy spread. I got the boat hid, hunkered down on my ammo box, and settled in. 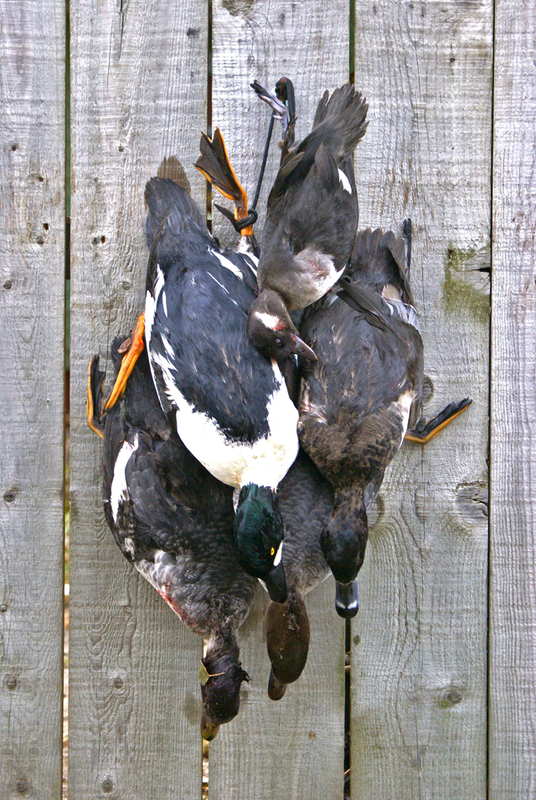 Before I could even relax I had a flock of goldeneyes bearing down on the decoys. I managed to drop a hen for the 1st bird of the day. Then a single hen goldeneye came in and I dropped that one. Before I could get to the boat to go and retrieve duck #2, a pair of ringers came whizzing bye and I dumped a nice drake. 3 ducks in the 1st half hour, not bad at all! After a few choice words to myself, I reloaded and looked to the left to see a pair of drake goldeneyes locked up and heading into the decoys. BOOM! BOOM! and I "pancaked" both of them. One landed out in the decoys, dead on impact. The other one hit the water right on the shore line. I walked over there and no duck? I looked around and there he was already out about 40yds swimming low in the water. I gave my best efforts to "water swat" him but they are about impossible to finish off on the water, especially at the distance. I hurried to the boat and paddled out after 'em. I picked up the downed bird and the wounded one dove under before I could get close enough and never came back up. I paddled back to shore disgusted on one hand but happy on the other as I finally had a late season drake goldeneye for the wall. Those drake goldeneyes have given me "fits" over the last couple of years. I got settled back in and it was a while before a hen bufflehead came buzzing into the spread. I pulled the rug out from under her and I was done for the day. Not a bad end to a less than stellar duck season. I had to break about 60 yds of 1/2" ice to reach open water. Fishing Report November 20, 2013 Jeff Sundin - Ice Watch 2013 = Stalemate. Strong Southeast winds on Tuesday held off any new ice from formning. Somehow, small lakes that had frozen already, managed to hang on to the ice cover. A tour around my neighborhood turned up little sign of a lake that was ready for the first trip onto the ice. Virtually all of the larger, deep water lakes remain wide open. Frozen water at many of the access ramps are all that prevents anyone from dropping in a boat. Shallow lakes, protected from the wind are frozen, but I wouldn't suggest trying to walk on any of them yet. There are a few lakes that could get there in a hurry, especially if the forecast of single digit low temperatures for late this week comes true. In fact, I'd expect to see a lot of change in the scenery between now and early next week. So if you're like me, still looking at a list of outside chores to wrap up, ya' better get after it. A Little Off Topic, but too important not to mention. The Itasca Gun Club, forced by economics and politics to move away from our long time home, has accomplished the first major leap toward reloctaion. The club has aquired new property just a few miles from our current location. Thanks to a lot of help from a lot of folks, the property is already 2/3 paid for and we are moving quickly toward finishing that off. We now have the approach to the property completed, ready to get the rest of the road work under way. That's the good news, now the real heavy lifting begins. Before we can draw up the official range plans, there's a half mile of road that needs to be cleared and built. It's going to be a real test, but the all volunteer membership, now nearly 700 strong has accomplished a lot of heavy lifting already. Still, the goal of having the new range at least partially functional in time for the 2014 sight in days, is optimistic to say the least. I'll slip in updates as they develop. Please, don't be too surprised if you happen to hear me ask for a little help one of these days. Fishing Report November 19, 2013 Jeff Sundin - Good Morning! I'm getting an early start on a special project this moring. Don't worry though, I started checking area lakes for ice yesterday and you're not missing out on anything yet. I'll be taking another tour of the area later today and will let you know how it's progressing. 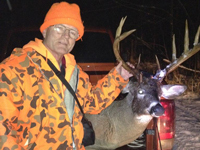 Fishing Report November 18, 2013 Jeff Sundin - Venison In The Freezer, Almost - I mentioned the other day that for me, this Deer hunting season could likely be a hunt for "Mr. Little", instead of Mr. Big. Well, the ol' Crystal Ball must have been tuned in and warmed up that day. It all started when I was walking my property, looking for eveidence of a nice buck to hunt for. 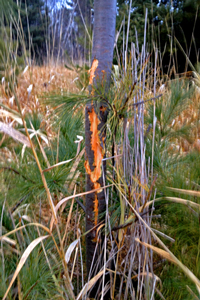 The sign was really scarce and only thing I came up with was a few small White Pines that had rubs just big enough to prove that the deer who made them had antlers. I remember thinking at the time, I sure did miss having venison in my freezer last winter. So if that's that's the only critter that's out here, then that's what I'll hunt for. Sunday afternoon, I was more excited than usual. The temperature was falling, the wind was getting blustery and I could see snow flakes whistling past me while I was working on chores in the yard. That kind of incoming weather has always been good luck for me. Whenever there's been a really good Deer story around here, there's been some snow in the picture. Anyway, it made me more enthusistic about getting out into my stand. I was carerful to follow all of my best Deer hunting practices. In other words, I climbed into my stand and fired up a stogie. Long story short; "Mr. Little", a spike buck decided to stroll by at about 4:20 PM. It didn't take too long to make a decision. All I had to do was think about was fixing a couple of those nice venision hamburgers. I must be getting soft or something. I look forward to having the vension because it's delicous and healthy. But I really don't look forward to shooting the Deer in order to get it. That's why I was so thankful that the 7mm08 did it's job. A single shot dropped this deer in it's tracks, not a move, not a sound, no chase into the swamp, nothing but the sound of breeze blowing through the trees came afterward. (11/18) "New- Western States Contour Elite PC Software - Humminbird released the Western States SD map card just over a month ago and it was met with instant success. Now its PC software counterpart has arrived! Humminbird brings the high definition LakeMaster lake maps of the West to your computer with the Western States Contour Elite. The Version 1 computer software covers the same high definition freshwater lakes in Arizona, California, Colorado, Idaho, Montana, New Mexico, Nevada, Oregon, Utah, Washington, and Wyoming." Learn more here >> Lakemaster Western States Contour Elite . Fishing Report November 17, 2013 Jeff Sundin - Just In A Nick Of Time - When it comes to figuring out natural things, the trick is to see events that lie ahead, not what's already in view. You may, from time to time, look at the past. But only as a guide to help you make the next forward looking decision. Some of my friends were giving me a hard time about skipping hunting during the past few days. The nice weather would have offered perfect opportunity to go out and play. On the other hand, I could have taken advantage of the same nice weather to get some work done. Chores that were on the first order of highest priority, especially in light of the fact that I KNOW what lies ahead. So, you can understand why I grinned at the weather forecast this morning. Today's high temperatures have already been reached and beginning later today, the ship will hit the sand. With a half day of decent weather on tap, I'll have just enough time to wrap up some loose ends. Then, I'm going hunting. This visit into the freezer section is going to produce another batch of news about frozen water. Don't be too surprised when you discover that the ice fishing season is upon us. (11/17) On The Iron Range, From Greg Clusiau; A Most Memorable Hunt - "Rounding a curve on county road 52, dad mentioned “this is where Marilyn helped me load a big 8 point buck that time.” Marilyn, my wife, was heading up to the deer camp to see how everyone was doing and came across my dad trying to load a big buck into the back of his pickup truck. Naturally, she had to stop and lend a hand and knowing her she didn’t like touching that thing one bit. I wish I could have seen that. One of his most memorable deer came when he was using a bolt-action 30-30 with a clip. He shot until running out of shells and had to pursue the animal without any ammo. Carrying the gun along so he wouldn’t lose it, he eventually caught up to it and ... " >> Read Greg's Full Report . Fishing Report November 15, 2013 Jeff Sundin - Ice Watch 2013 - If it moved at all, ice cover moved backwards on Thursday. Moderate temperatures and light wind did little to encourage the formation on new ice, but didn't melt it either. I finally found my way to the Deer stand on Thursday. 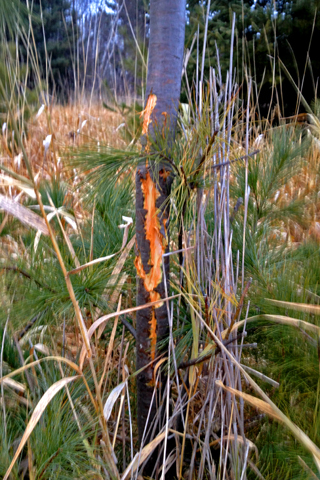 The hunt was uneventful, but the discovery of several rubs and scrapes in my territory did perk me up a little bit. I already know better than to expect a lot of attention out there this fall. But at least I'll have a critter in mind while I'm waiting. Otherwise I might focus too much on my application as the new "Maytag Repair Man" during the process. On my way to the Deer stand, I noticed that shallow ponds, frozen before the first snow that fell a week ago, are still frozen and covered with snow. I'm thinking that means that these small waters will remain ice-covered for the balance of the winter. Snow that had covered the ground throughout most of the Itasca area, disappeared from open areas. But it's still white under shady spots, areas with tree cover ... anyplace where the sun hasn't reached. Larger waters have some ice cover too, but today's forecast for a warmer, sunnier day, along with the promise of rain tomorrow, means that these lakes will almost certainly open back up. The next cold snap is likely to be the real deal and I'm expecting that my original prediction of ice fishing over the Thanksgiving weekend will be on track. At least in some places around the greater Grand Rapids Area. (11/15) Good morning, Bowstring, with no wind, iced over this morning. I will be surprised if it stays covered. - Mike Collins . Fishing Report November 14, 2013 Jeff Sundin - Ice Watch 2013, The plot is thickening! It's funny how things balance out. During the fall fishing season, water temperatures were consistently 5 to 8 degrees warmer than they had been a year ago. Today, ice conditions are already weeks ahead of where they were at this time last year. In fact, I've heard reports of ice That Has Already Been Walked On at some Northern Minnesota lakes. I can't encourage you to do that just yet, it's not safe. But if you're the type that likes to be ready early, then you better start going through your tackle boxes and polishing up your auger blades. In the Deer River area, shallow snow that fell early Monday morning has remained on the ground. Small ponds and protected bays are ice covered already. So far, I haven't seen any larger lakes with ice cover and windy conditions are discouraging a full scale freeze up. Upper Red Lake, usually an early freezer, has some ice cover. But there too, windy conditions are preventing the lake from locking up. The weather forecast for the rest of this week calls for highs above freezing, but night time temperatures will still allow ice to form. Barring a major warm-up, lakes that have aready frozen are unlikely to re-open. (11/14) Getting into the Christmas Spirit? I Know! It's sneaking up fast and everyone has a couple of those "hard to buy for" people on their shopping list. If they're anglers, then you might be intersted in a couple of handy ideas to get them taken care of early this season. Bill Dance Advantage Lure Retriever - Saves snagged crankbaits/saves money. Holiday Stocking Filled with bass lures. Pre-assembled ready to hang and the stocking is reusable. Lurenet’s Holiday Stocking comes already filled with great bass lures at price half of what it would cost if purchased separately. You get BOOYAH Spinnerbaits, Bomber crankbaits, YUM soft plastics and more. Cost: $19.99 at Lurenet.com >> Holiday Stocking Filled with bass lures . (11/13) Ice Fishing Rods and gearing up for the ice fishing season - You may recall reading my comments last December about my discovery of TFO's ice fishing rod lineup. At the time, I was looking forward to taking them out and giving them a thorough test. For me, the ice rods passed the test with flying colors. In fact, it lead me to purcahse a half dozen more TFO's for the open water season. Anglers who like the idea of fishing with a really nice fishing rod, but who can't justify spending upwards of $100 for an ice stick, need to check out these rods. Priced at $40, these rods compare with higher end, custom rods and allow the average angtler to head onto the ice armed with a really effective tool. The Gary Loomis, signature series rods are offered in five powers, ranging from ultra light to medium heavy. You can get the rest of the story by clicking >> Temple Fork Outfitters Hard Water Ice Rods . By the way, in the interest of full disclosure, you should know that TFO is not a sponsor and that each and every one of my TFO Rods has been purchased over the counter. Now maybe that relationship will change one of these days, but if it does, it will be because I pursued them as a fan who loves their products and their philosphy. It will be because I endorse them and want to be a part of their winning philosophy. Fishing Report November 12, 2013 Jeff Sundin - A quick heads up! Welcome my new family member, Sandy. She's a pretty girl, but she's got a lot of get up and go. So much, that once she did, my chickens all got up and went. My schedule is gonna be thrown off for a little while so that I can round 'em all up and figure out how to restore peace and harmony. Don't be worried though, all regularly scheduled "Multi-Tasking" will continue as planned. But, you might notice that the schedule changes a little bit for a few days. Ah, the joys of raising two girls ... I Love It! Fishing Report November 11, 2013 Jeff Sundin - At This Rate, Ice Watch 2013 - Is gonna go a whole lot faster than it did last winter. It seems like I drove around the country side every single day for weeks, searching for the first ice covered lake where I could creep out to wet a line. Fast forward to this week and the predicted cold weather that awaits us. With daytime temperatures promised to remain below 30 degrees, lakes will be fast moving ito the ice fishing season. In fact, it's beginning to look like my earlier observations about spotting ice fishermen on the lakes by Thanksgiving Weekend is going to be darn close. With some pressing chores to wrap up, I'll be sticking close to home today. But tomorrow, I'll start touring the area, gathering some photos of what the lakes look like up here. W ith good Deer Hunting reports haunting me, I'll have to get into my Deer Stand pretty darn soon. But first, I've just got to wrap up some chores right here, around the house. (11/11) In the Bowstring Lake Area Otters Guide Service, Robby Ott Says; "The Rut is on!! Steve Ott heard massive crashing a ways from his stand. With the wind in his favor, he still hunted this Bowstring Bruiser within 35 yards. This Buck was in Hot Pursuit of his girl friend." (11/11) Ice Fishing In A Boat? - Just because your favorite lake has yet to freeze over doesn’t mean you can’t go ice fishing. No, we’re not talking about performing miracles, or walking on water like another ancient fisherman once did. Last year, three top teams at the ... >> Read Full Report . (11/11) On The Iron Range, From Greg Clusiau; "That’s it! My Ontario deer hunting experience is over for this year. It turned out to be an extremely tough hunt, but was well worth the time and money spent and it was an odd feeling, hunting whitetails on the Minnesota deer opener but not being in Minnesota. Having done countless fishing trips in Ontario, this was my first time ever crossing the border with a gun. All it takes is a little paper work, $25, and you're good to go. Only my deer rifle was registered but after seeing dozens of birds (spruce hens, ruffed grouse, and sharptail) in the four days I hunted, I think that next time, I'll be ... " >> Read Greg's Full Report . Fishing Report November 10, 2013 Jeff Sundin - Ice Watch 2013 - Thank You to Todd Heitcamp and all of the folks from The Dakota Angler who rolled out the welcome mat this weekend. It was my first visit to the Ice Institue, but I'm hoping that it won't be my last. The event was well attended and the fishermen, fisherwomen in the Sioux Falls area really know their stuff. 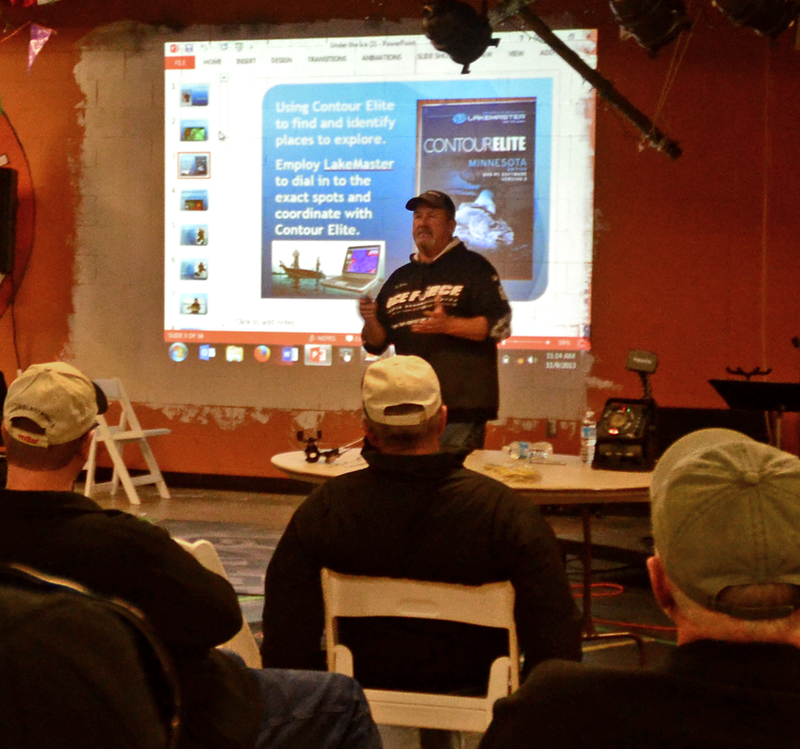 In fact, the anglers who attended the event were amazingly engaged and hungry for knowledge. Many of them made a point of being on hand from start to finish, watching every single speaker on the schedule. The lineup of speakers was fantastic too and the room was packed for every semninar. There was a lot of great information about ice fishing changing hands this weekend. Ice Institute vendors know their stuff too and I walked away from this event know a lot more than I knew before. I already spent a few bucks on some neat gadgets, but my list of things to go back for is still a long one. On Saturday, I just couldn't help myself. I kept finding my way back to the 13 fishing display, where they were showing off this really nice little reel that they call the Teardrop. It's not exactly an in-line and it's not a spinning reel either. It's sort of a hybrid version of a casting reel that's turned upside down and backwards. It features an instant stopping anti-reverse, 8 ball bearings and a fast, 6.1-:1 gear ratio. To me, the reel's free fall feels wonderfully smooth and the reel feels very solid and well built. The folks at 13 fishing describe it this way; "A ultra sleek light composite body surrounds the narrow spool, and Japanese high spin bearings deliver even the lightest ice jigs to the bottom with ease. The push button thumb bar free spool release is easy to use and familiar for any angler that has fished open water. Instant anti-reverse, oversize line window to reduce ice build up, and a ridiculously smooth carbon drag system are all featured in this inline zero line twist design." What impressed me about the Teardrop was that it won't limit me to ice fishing. I can envision these reels easily doubling as open water panfish reels, especially during the fall when we fish for suspended Crappies over deep water. With ice fishing season just around the corner, I'll be putting a couple of Teardrops into action and you'll be the first to know how they work out. Learn more right now >> 13 Fishing Teardop . Fishing Report November 9, 2013 Jeff Sundin - Ice Watch 2013 - Good Morning! A quick update for everyone who would rather be sitting on the ice, fishing, instead of hunting. It won't be long! Along the road to the Ice Institute, ponds in the Northern portion of Minnesota are freezing fast. In fact, there were several ponds that had been ice covered for days. Most larger lakes remain open, but evidence of ice forming along shoreline edges was easy to spot. 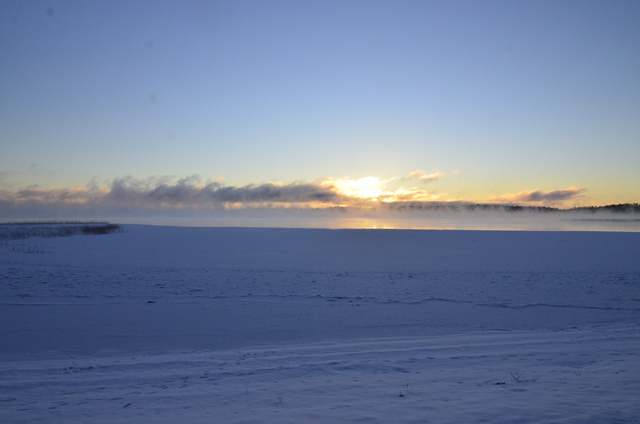 there were a handul of small, 100 to 200 acre lakes that had solid ice sheets, formed over night on Thursday/Friday. The Ice Institute in Sioux Falls, SD started at 5:00 PM on Friday. Todd Heitcamp and his crew have the show floor packed with everything that an ice fisherman could want and it's going to be a great day to stop by and pay us a visit. Click to see the lineup and for tickets to the Dakota Angler Ice Institute . The Lindy Tungsten Toads are in and I'll be on hand to show you how to use them. My seminar starts at 9:00 AM this morning and I'd really like to see you there. Fishing Report November 8, 2013 Jeff Sundin - Ice Watch 2013 - As folks head North for the Deer Season Opener, I'll be easing my way toward the official 2013-2014 ice fishing season. The Dakota Angler Ice Institute begins today, November 8th at 5:00 PM and runs all day on Saturday, November 9th, 2013. Todd Heitkamp and the folks at Dakota Anglers have announced the lineup of speakers and it's a great one. I promise, if you show up, you're gonna learn a lot about ice fishing. It's all on display, the latest ice fishing products for the 2014 ice fishing season, all of the most up to date electronics and a whole bunch of really talented fishing pros to tell you all about them. My seminar focuses on finding fish on "New Water" and is scheduled for 9:00 AM on Saturday morning. I wish you would just show up! Just get yourself into the neighborhood, make one stop and learn everything you'll need to know. The event is held at the Family Life Central at Central Baptist Church in Sioux Falls, SD. Food included, as well as a chance for door prizes! Click to see the lineup and for tickets to the Dakota Angler Ice Institute . (11/8) From the Deer River Area - Brian Castellano checked in with "Maggie and I hit the big water for divers on Tuesday morning. While we only saw 50-70 ducks, my shooting was ON and we ended up 1 short of a limit. 1 hen goldeneye, 1 hen bufflehead, 1 hen bluebill, and 2 drake bluebills. I saw a HUGE swan migration that morning, guessing I saw 1,000 to 2,000 swans up high, "V'd" up and making their way south. Today a friend and I decided to give the muskies one last chance. We found Moose Lake and Deer Lake landings iced up to the point where we didn't want to risk breaking anything trying to land the boat. We headed up to the Mosomo Lanidng and it was open. We headed out to Big Cutfoot and fished from 10:30 till about 4:00. While we never saw any muskie activity, my fishing partner put a fat 32" gator in the boat. Water temps were in the 41-43 degree range. We split up our time between casting and trolling. We talked to some walleye fisherman that were having some luck. They had 7 keepers in the boat and a couple of slot fish. They also said the northerns were really biting. They were jig fishing in 11-13' of water. We saw very few ducks around......maybe 20. I'm really hoping for a few more decent shoots before season ends on the 19th. - Good luck deer hunting this weekend! - Brian"
Fishing Report November 7, 2013 Jeff Sundin - Ice Watch 2013 - Northern Minnesota lakes remain open. Diving Ducks, Geese and Swans still inhabit the Deer River area, but they'll be losing their territory to sheets of ice before long. On Wednesday, I took a quick trip down the road and found ice covering about 1/2 of the little Deer River. At White Oak Lake, hundreds of Coots were still working the weed edges and except for a few areas where ice had formed along the shoreline, the lake was wide open. We know that surface water temperatures remained un-seasonably warm during October. But I snuck a peek at the weather forecast this morning and from what I can see, I'd be willing to bet that we'll hear our first reports of ice fishermen on the lakes by Thanksgiving weekend. I'll make some time later today too and try to get a more in depth report, maybe even capture a couple of photos from area lakes. (11/07) A shout echoes unanswered across the barren icepack of Minnesota’s massive Upper Red Lake. It’s hardly a call for help, much less a greeting. It’s veteran walleye guide Jonny Petrowske, proving a point about getting away from the crowd to corral first-ice ’eyes. “If I yell at the top of my lungs and no one hears me, I’m far enough away from other anglers,” he grins. Petrowske says that even aggressive walleyes get skittish when clamorous hordes of winter warriors overrun the ice. Since the only reply to his thunderous vociferations was the raspy, disapproving cackle of a raven drifting overhead, it appears we’re good to go. We’re targeting early winter walleyes shortly after the mighty lake’s surface has solidified. Shallow and relatively featureless, Upper Red is ... Read full story >> First-Freeze Walleyes On Featureless Lakes . 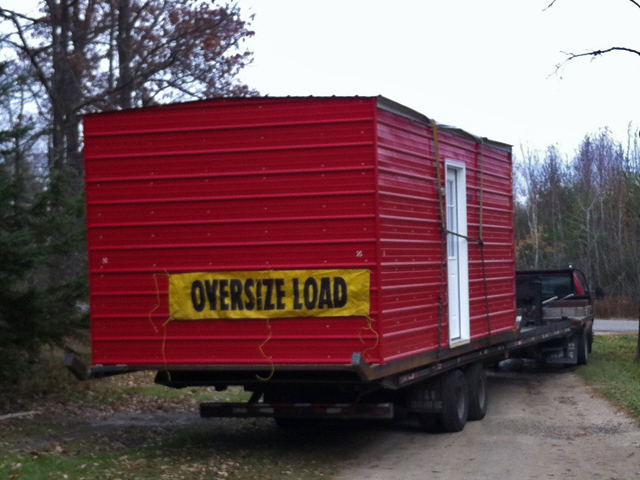 (11/07) In case anyone happens to have one laying around; I'm still in the market for a reliable snowmobile trailer. It needs to be at least 12 feet long, so that it will handle that Big Bearcat that I picked up last winter. I'd sure like to pick one up from a trusted friend, so if you can help out, I'd owe you one! >> Click to contact Jeff Sundin . (11/07) The 2014 Lund Boat lineup has been released and the new catalogs are available. You can see all of the 2014 models right now at lundboats.com. Check out all the great new fiberglass and aluminum models, like the 208 Tyee, 2075 Tyee, 1675 Crossover, and more. Want to get the lowdown on all Lund 2014 models? Well, now you can! New catalogs are available. They've got everything you need to know about our entire family of boats. If you haven't received your copy, you can >> Request Lund Boats Catalog Here . OH! By the way, you can view it online too and when you do, I'd suggest paying special attention to my two lovely daughters by starting on >> THIS PAGE . (11/07) Here's the link to the original comparison of Mercury's 4 stroke vs Their OptiMax 2 stroke engines. Read >> OptiMax vs 4 Stroke For Fishing . Fishing Report November 6, 2013 Jeff Sundin - Open Water, For Now - Northern Minnesota was spared the wintery mix of snow and rain that blew through most of Minnesota on Tuesday. Later this morning, we'll be watching the Sun rise into a clear Blue sky. A chilly one, probably cold enough to make some fresh ice. We had already seen a fair number of lakes sporting sheets of ice last week. On our trip West toward North Dakota, several small lakes, ponds and even shoreline areas of larger lakes were already frozen. The subsequent warm period allowed those waters to re-open, but the week ahead promises to be another ice-maker. Forecasting lows in the 20's and highs in the 30's, the National Weather Serivice appears to be signaling the start of "Ice Watch 2013". But before it's too late, anglers with boats still ready to fish could get in on some interesting fishing, but you'll have to hurry! (11/6) Jordan Lee Spells It Out - How I Qualified For The Lake Guntersville, Bassmaster Classic; "I could see baitfish flicker in the sunlight, and they were pretty small, so I trimmed the skirt even with the hook bend and added a No. 2 trailer hook. While I wouldn’t say I whupped ‘em on the bait during practice, I did catch enough to gain confidence in that area and refine the pattern. I thought the spinnerbait would produce, at least early in the day. It was calm as we launched the first two days of the tournament. I weighed in two fish on the ... Read Story >> How Jordan Lee Qualified for The Lake Guntersville, Bassmaster Classic . 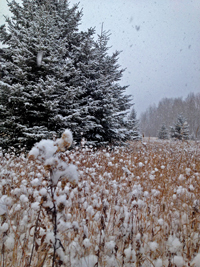 (11/06) On The Iron Range, From Greg Clusiau; "The thought came to me during last year’s deer hunting season. I would abandon my annual Minnesota deer hunting ritual and make a trip across the border into Ontario instead. Tired of the “same old thing”, this would be a fresh new adventure for me. Having fished in Canada at least a couple hundred times, I had never hunted there before and it was time to do so. Dates were lined up with fishing buddy and soon to be hunting partner Jeremy Taschuk who resides just across the border in Ft. Frances. 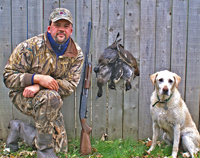 Taschuk, along with his wife Mindy, both had guide licenses and I would be hunting with them. The first spot was a classic. Jeremy walked me in and placed me in a great looking area. There was plenty of shooting space and a corn pile was strategically placed about 70 yards away. This was new to me, as baiting isn’t allowed in Minnesota but in Ontario ... " >> Read Greg's Full Report . Fishing Report November 05, 2013 Jeff Sundin - For someone who didn't fish yesterday, I sure did drum up a lot of news. So lets just dive right in. OH, by the way, I'll be helping out at the Itasca Gun Club rifle range all day long today. Why don't you pack up your Deer Rifle, come out to sight it in and then we might even have free minute to chat. (11/05) From Rick Syverson; "Hello Jeff, A question for you regarding Walleye, Ice Fishing. This is from what someone said during conversations at the Blaine Expo. A gent the fishes out by McArdle’s on Winnie made the comment that the Walleye’s like the deep water. And at night will come into shallow waters at night. Okay, I have heard this from friends Ice Fishing other lakes. Fishing another lake, these friends said they set up Tip-up’s in 4’ of water, catching very large Walleye at night. Fishing Winnie for about 15 years, I have from resort owners that the fishing shuts down at night. But one of our first fishing trips, renting a house from North Pines or Tamarac Lodge, we were catching Tulibee late night. 3-years ago fishing out of Nodak’s, from 5:30 to 8:00 p.m., it was the most Walleye’s I have ever caught. I have heard some fishing Winnie saying they were catching Walleye around 10 p.m.. I think when the Resort Owners are saying the fishing dies off at dark, must mean the Perch Bite. But the Walleye fishing is still an opportunity at night? About going into the shallows at night. If at Nodak’s we were in 18’ to 20’ of water at 5:30 to 8:00 p.m., does that mean during the day they may have been in 25’ to 35’ of water? How shallow would the Walleye go on Winnie? A) Rick, first of all, don't be baffled! Like most things in life, the answers are really simple and only become complicated once we start "Thinking" about them. We possess all of the same instincts that the fish do, they go all of the way back to our Primordial Ooze. Trust yourself and your instinct to figure it out and you will be amazed at how easy it becomes. We could talk about this for days and still not get to a complete answer. So in the interest of time, I'm going to generalize a little, the simple answer is YES, there are many opportunities to catch Walleye at night, especially during the winter. What can be confusing, is that over the years, Winnibigoshish has been a notoriously good daytime Walleye Lake ... DURING THE SUMMER. In fact, most of my best fishing trips on Winnie have occurred smack dab in the middle of the day. Say hello to growing populations of filter feeding critters like Banded Mystery Snails, Faucet Snails and Zebra Mussels. Now we're seeing deeper weedlines and clearer water which will encourage a shift in this primary daytime pattern, even during the summer. We can talk about that another time. There are only a few things that you'll ever need to know about Walleye to make most of the puzzle fall into place. For me, two of them stand out as the most important of all. Like all living things, their food source dictates their location. Even though they are capable of moving some considerable distance over a short time, they typically won't do that. No matter whether the water is deep or shallow, they'll usually stay close to the forage. It doesn't matter to the fish if it's deep or shallow, they can go either way. Thanks to their phenomenal eyesight, Walleye can see during low light periods and have a distinct feeding advantage during those times. Typically associated with twilight (Crepuscular) periods during early morning and late evening. They use that advantage to feed when they can see, but their prey can't. On Winnie, the most noticeable trend toward Walleye feeding during these twilight periods begins sometime in the fall, usually from the middle to late October, after the turnover. That's when colder water becomes re-oxygenated, clearer and when deep water becomes more inhabitable. In other words, the fish can go wherever they want, wherever they are the most comfortable and wherever the best food sources are. The Walleye can go deep if they want to and some of them do. But there are also many areas where healthy weed cover remains throughout the winter and lots of fish will stay close to these handy feeding locations as well. Any cover that will hold baitfish, will also hold Walleye. Theories about fishing moving deep and shallow abound, But for me, the more important question is about timing. During winter, there are very, very few lakes that produce consistent Walleye catches during mid-day. Cold blooded critters like fish have a much lower metabolism during winter. They do not require as much food to survive. So it's not that they won't eat, it's just that they don't need to eat, at least not as often as they do during warm water periods. that's why we have trouble catching them during the daytime, they wait until the pickin's are easy, they hold off feeding until those twilight times. Shallow water Walleye will almost certainly feed for short periods during morning and evening. They don't move in from deeper water, they are already there, they've just waited to feed until the timing was right. You can prove this to yourself by watching the screen of your graph. You'll see numerous fish that move up to your bait, take a close look and then swim away. As the light conditions change, all of the sudden, one of them will take the bait and then for a while, if they look, they strike. After a short time, that feeding period runs its course and fizzles out. Walleye that are relating to to deeper structures behave in much the same way, but the timing may be slightly different. An angler could expect that Walleye on a deep, main lake bar, could get active somewhat earlier than the fish in shallow water, but the pattern would be similar. In my experience, the lull that occurs after this feeding run is commonly mistaken for the end of the action. But frequently, there is another burst of action a few hours later. The problem is that most of us aren't out there at those times and miss out on those late night feeding sessions. During winter on Winnibigoshish, your most consistent Walleye fishing will be during early morning and late evening. There will definitely be occasions when late night will produce fish, especially during the early part of the season. Don't expect this to be as consistent as the crepuscular movements, but don't rule it out either. Finding the forage and marking fish on your electronics will tell you where to be set up during the prime time feeding periods. It doesn't really matter if you specialize in fishing shallow or deep water, because there will be fish located in both territories. It's the food that holds the fish there, not the water depth. Pin me down for more info, if you need some more specifics, let me know and we'll keep this project going while we wait for the ice to form. (11/05) Bemidji Lakes Area, Paul A. Nelson, Bemidji Area Lakes Guide Service says; "Most anglers will have their boats put away for the winter before the rifle deer season opens. A few anglers keep their boats ready to fish until they can't get a boat in the water any longer. Location is the key to catching most species of fish late in the season. Fish tend to be concentrated into specific areas during the cold water period rather than spread out like they are during much of the summer. Anglers can find walleyes on both mid-lake and shoreline structure late in the season. The two most important features for walleye location during the cold water period in most lakes is the presence of baitfish and direct access to deep water. Crappie anglers are able to find schools of crappies suspended over deep water, with the crappies usually relating to some sort of an edge or structural element rather than wandering aimlessly in open water. Perch have been both on the edges of shallow flats or have moved into deeper water to feed on bloodworms, mayfly larvae and other insects living in the mud basin. Muskies and big pike will be relating to the tulibees that recently finished spawning on windswept shorelines or in current areas, which are many of the same areas used by walleyes and suckers to spawn in the spring. Bass anglers are finding bass schooling along the deep weed edge or suspended over deeper water." - Paul A. Nelson, Bemidji Area Lakes Guide Service, panelson@paulbunyan.net - 218.759.2235 . (11/05) PRADCO Makes Donation to Bass Fishing Hall of Fame - The Bass Fishing Hall of Fame engaged in a campaign to raise funds for a permanent bass fishing Hall of Fame in Cullman, Ala. They announced on Oct. 31, 2013 that PRADCO Fishing made a large cash donation to help push them closer to their next mandatory funding plateau. “This generous contribution made by Pradco is providing the much-needed seed capital to help us move closer to the kickoff of our major fundraising efforts for the Hall,” said Donald Howell, board member and BFHOF capital campaign chairman. “With additional support from .. >> Read Story PRADCO Makes Donation to Bass Fishing Hall of Fame . 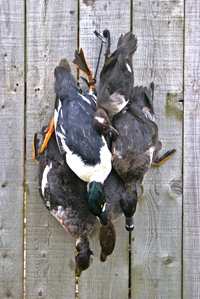 Fishing Report November 04, 2013 Jeff Sundin - Back From The Hunt - With just enough birds to prove that we were there. Compared to past hunts, production of "bagged birds" was definitely down. Luckily, success is measured in memories, not meat. Bill Powell, my hunting partner, tells me that this was our 13th season together. He's probably right, but the time sure seemed to fly by. If you add those 13 years to the ones that I spent out there by myself or with other friends, it's pushing 20 years for me. Originally, it started as a Duck hunting trip. But we both love to hunt Pheasants too, so over those years we've covered a lot of ground, looking for areas where we could do some of both. It's meant that we've needed to make adjustments, switching territory whenever the timing seemed right. This time, the timing seems right to make another adjustment, but to where? Last year, I mentioned more than once, how concerned we were about the amount of CRP lands, small sloughs and wet spots in the fileds that were being burned and tilled under. Now, back in production as crop land, you can barely even notice that they're missing. That is unless you're driving the county side, trying to find places to hunt. Many of those little Cattail swamps and swales of tall grass are just gone, blended back into the crops. When you do spot something that looks interesting, there's likely to be a no hunting sign in front of it. When you ask for permission ... well, let's just say that it's getting tougher to find a spot all of the time. Bill and I have had pretty fair luck in the past by finding public hunting spots, but they've been worked hard and even some of our "honey holes", produced very few birds. If the lack of available cover wasn't enough of a challenge, the late spring forced a late planting season and even now, most of the Corn was still standing. So we'll really never know for sure how many Pheasants are still out there. Certainly, there are a lot of them in those gigantic Corn fields, but they won't be accessible until after it's all been picked. We'll just have to be patient. We'll just have to wait as the story unfolds. A good nesting season next spring would really help, right now, that's what I'm hoping for. Duck hunting was better, we were persistent and we did find some good places to try our luck. We made a couple of mistakes in selecting our spots, but we always do. We could have bagged a few more birds if we had been more aggressive about our shoooting too, but we like watching them fly as much as we like shooting at them, maybe more. Still, we had a couple of decent days in the duck blinds and I can't think of too much that I'd rather have been doing. The conditions out there were still wet and there are lots of shallow puddles. We expected to see some ice, especially in light of the fact that we'd seen ice along the edges of many Minnesota lakes on our trip out there. But the North Dakota waters that we saw were all open. There were still lots of Teal, Gadwalls, Shovelers and Coot in the region. There were some Geese, but not a lot and the Mallards that we bagged seemed like younger, local birds. So the best hunting for Geese and late season, Northern Mallards is likely still to come. (11/4) An article released this weekend quotes Jon Thelen about Ice Panfish. Thelen says; "Pay special attention to the top portion of the jigs you select, especially if you’re fishing deeper water. A jig with a wide, flat head like the Lindy Bug is easier for your electronics to pick up. Jigs like the Lindy Toad are great for shallower water when anglers need to punch through weeds. Both jigs feature a slightly offset hook for a better bite on the hookset. Use glow finishes and use a Tazer to recharge it every 15 minutes or so. Panfish rely more on sight for feeding than other senses, and the glow makes it easier for them to see and accurately strike the jig." 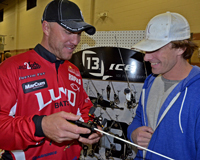 There's More ... Click to read >> The Lindy Ice Fishing Primer . (11/04) The hard water fishing season, is coming faster than you think and Ryan Peterson checked in; "I'm ready for winter and getting the ice shelters ready for the move onto Lake Winnibigoshish." On Wednesday Ryan mentioned that he's been setting up a brand new 10 by 20 ft, 4 person sleeper set to hit lake Winnie this ice fishing season. This shelter provides a bunk over futon, full twin size mattresses, cook stove, spray foamed insulation that holds heat great. The new sleeper will be a welcome addition to his fleet of other great sleeper and day houses. Winnibigosh has always been a destination for Perch anglers, but during recent ice fishing seasons, Winnie has also been a reliable producer of early ice Walleyes. This year, you can get in on the early action yourself. Just click here to learn more >> Ryan Peterson's Guiding . Please welcome ONIX and ION, introduced on Thursday, October 31st, at the Ft. Lauderdale International Boat Show. At the core of the new units, users will discover ... Read Full Story >> Humminbird Releases ONIX and ION . Hoofing it to your favorite spot this weekend? Have fun, but be careful! Happy Thanksgiving! Ready or not, here we go. Winter was in a hurry to get here this season, fasten your seat belts, here we go! Photo Courtesy Ryan Peterson: Lake Winnibigoshish, ice covered at the South end, It won't be long before Ryan's Ice Shelter Rentals are out and ready. Virtually all of the small ponds and shallow lakes have ice cover on them right now. This one, not far from Deer River has a dusting of snow on it. That means it's been frozen for at least a full day, maybe two. The deeper waters of some larger lakes are still holding out against the ice. But even lakes that are notorious for being late freezers, turned up with ice cover along their shorelines on Friday. 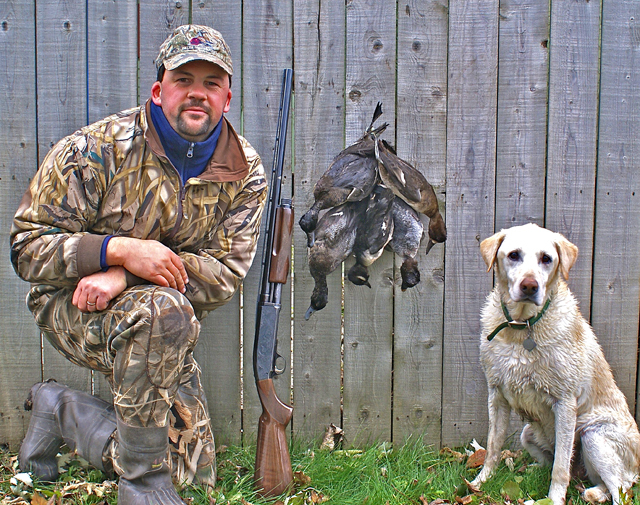 Photo: Brian Castellano who said; "Not a bad end to a less than stellar duck season. I had to break about 60 yds of 1/2" ice to reach open water. 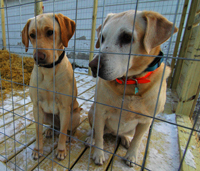 Time to put the duck gear away and get the ice fishing gear ready." The first step into Itasca Gun Club's new location. Now that the approach is in, a half mile of new road comes next. When all I could find were a few small White Pines with rubs just big enough to prove that the critter who made them had antlers. The hunt for Mr. Little began. 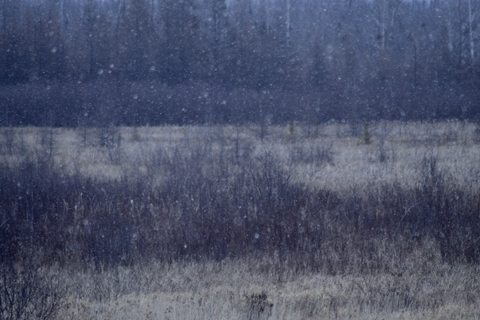 Snow falling encourages Deer to move earlier than usual in the evening. Or were they just bored watching the Vikings and decided to go for a walk? Photo Greg Clusiau: "If These Walls Could Talk...Just a few of the antlers gracing the wall of our hunting shack. Even if hunting is slow, a glance at the wall can conjure up enough memories to last a lifetime." Read Greg's Story . Cold Snap Outdoors' Auger Blade Cover is so simple, but so effective that I think it's just a matter of time before we're all gonna have one. Check this out >> Cold Snap Outdoors . OH OH! Look who's back to raising two girls again! Now, where the heck are all of my chickens? Photo Robby Ott, Otters Guide Service: "The Rut is on!! Steve Ott heard massive crashing a ways from his stand. With the wind in his favor, he still hunted this Bowstring Bruiser within 35 yards. This Buck was in Hot Pursuit of his girl friend." Just because your favorite lake has yet to freeze over doesn’t mean you can’t go ice fishing. Find ‘em first in a boat and you’ll be light years ahead of the pack once safe ice arrives, with fresh hungry fish awaiting lures below ... Read >> AquaVu Ice Fishing Practice Makes Perfect . Ice Institute seminars were well attended. Caught in the act, Ice Institute speaker, Tom Neustrom talking to a packed house, about life under the ice. The Lindy Tungsten Toads are in and I'll be on hand to show you how to use them. My seminar starts at 9:00 AM this morning. Get 'em while the gettin's good. Brian Castellano turned in a good performance on Tuesday, finding Divers in the Deer river area. Brian overcame low numbers with Good Shooting. 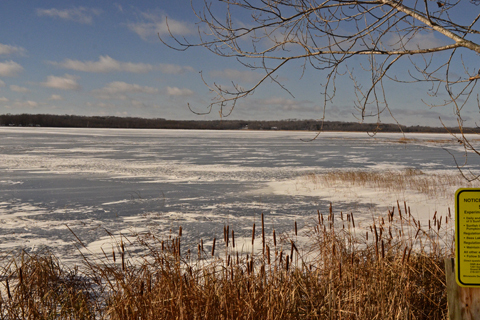 Boat landings at Deer River area lakes are beginning to freeze up. There's still open water out there, but getting to it is gonna start being tricky. Dakota Anglers have announced the lineup of speakers and it's a great one. I promise, if you show up, you're gonna learn! Get yourself into the neighborhood, make one stop and learn everything you'll need to know. Click >> Dakota Anglers Ice Institute . The Canisteo Mine Pit is now open to liberalized fishing regulations. Until December 1, 2013 Under liberalized fishing regulations, residents may take fish without any bag or size limits, in any manner except by use of ... Read Full Story >> The Canisteo Mine Pit is open to liberalized fishing regulations . 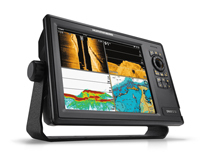 Humminbird® Unveils Most Powerful Electronics Yet! Humminbird ONIX and Humminbird ION bring bluewater and freshwater anglers unparalleled power via user-friendly Cross Touch™ technology. Click to read >> Humminbird ONIX and Humminbird ION . She's all trained in and ready to take you to the fish. For Sale 2013 Lund 20 foot Alaskan, 2013 90 HP OptMax Big Tiller, Shoreland'r Tailer. All accessories rigged, ready and included! Click here for details Lund Alaskan For Sale . Ryan Peterson has been setting up his brand new 10 by 20 ft, 4 person sleeper. The rental shelter is set to hit lake Winnie this ice fishing season and provides a bunk over futon, full twin size mattresses, cook stove, spray foamed insulation that holds heat great. The new sleeper will be a welcome addition to his fleet of other great sleeper and day rental ice houses.